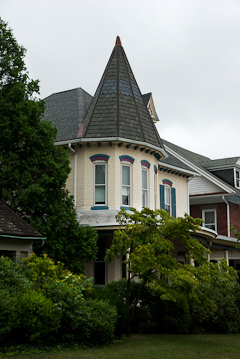 “It’s like Chevy Chase in the 1950s” said a friend of the North End neighborhood of Hagerstown, Maryland when I was scouting new digs in the wake of a building fire in central Maryland in 2006. I suppose as I drift int the history of the town, I shall get to know some of the streets and their homes intimately. Already, I’ve friends here who have owned two or three of these properties in the course of their lives (before moving elsewhere in the area), but I haven’t yet been so deliberate nor impertinent with a notebook as to connect “who” with “which”. 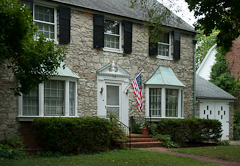 Then too with old neighborhoods, contemporary owners, however colorful their lives, may not be half so interesting as the first builders and owners. The slave blocks of Antebellum America and later the Underground Railroad have had their presence on the streets I now walk, and old European influences, which is how I “read” that appearing on the right, have left their statements in the architecture. Sad to say I walk the North End for fresh air, not as a photographer or scholar per se, although today it felt both awkward and then good to be out with a “real camera” — a Nikon D200 with a 16-85mm VRII zoom, essentially a tourist’s lens, on it. It’s a capable machine, one more easily controlled than the Lumix Lx5. Of course, the paunchy goof in the brimmed hat with the camera bag will draw attention — not like cool dude just out on a walk with a barely there “MAG” (for “man bag”, “MAG” is the best I’m going to do for a while) on the shoulder with a slip of a camera in it — but such may draw a “hello”. So that happened today. 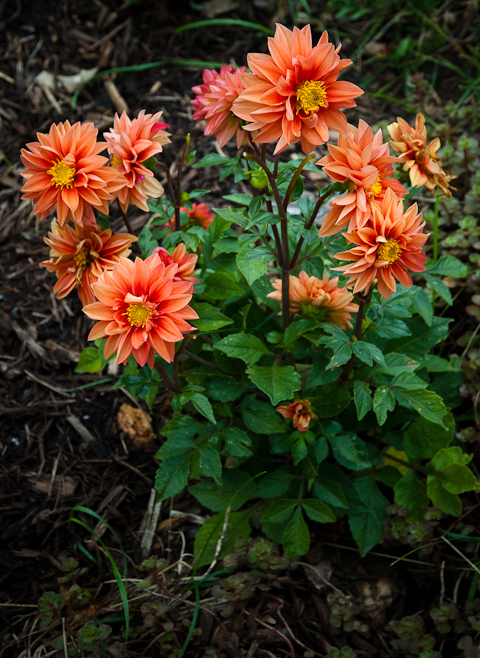 While looking over a home for sale on a corner opposite his house, I met a homeowner who repairs and restores things for a living and in his spare time raises Dahlia. We had a good chat, quintessentially American, starting with the restoration of old floorboards and closing in on the restoration of the country. (If you follow me here, I may tease, but you know that I’m not going into all that in this space). I am thankful for having a place to walk, one that provides relief from the now too familiar circuit around Fairgrounds Park, also close by. How much I wish to hang out in town, I don’t know, but I do know I’m not feeling one-hundred percent (age x leukemia x social life = good grief and God have mercy!”) and quite possibly will never again feel right. Whether the lassitude setting in relates to the change in an old relationship (she married someone else, not that I wanted the bill) or rising WBCs (handily filtered by a gently swelling lymph gland) — or the cool and damp July weather — it’s hard to say, but whatever the cause, I’ve been feeling like an old lost dog this afternoon. 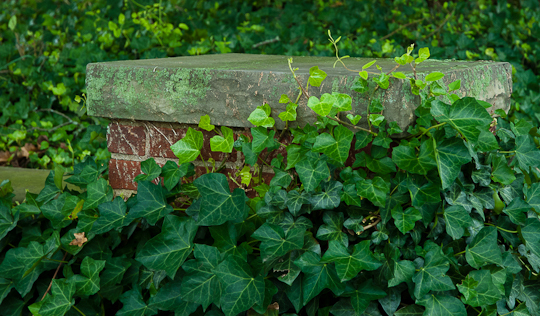 Ivy Encrusted Wall, North End, Hagerstown, Maryland, July 2012. 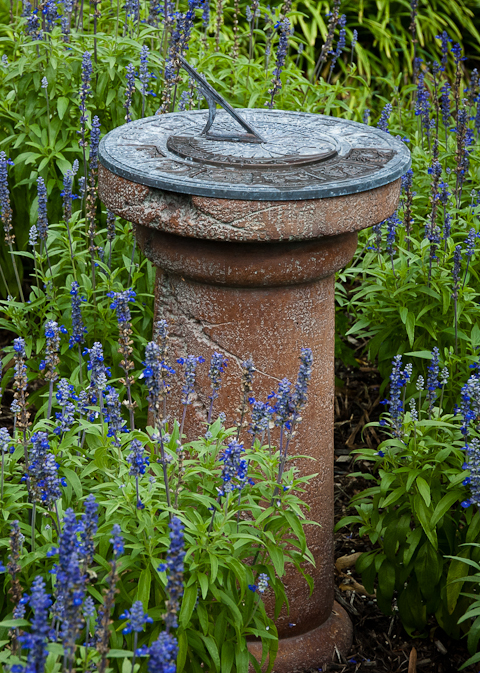 Another Reminder of Time — Sundial, North End, Hagerstown, Maryland, July 2012. 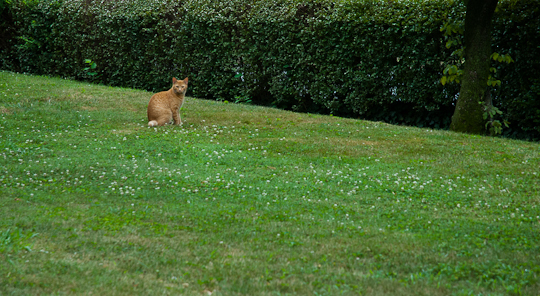 Cat in the Yard, North End, Hagerstown, Maryland, July 2012. 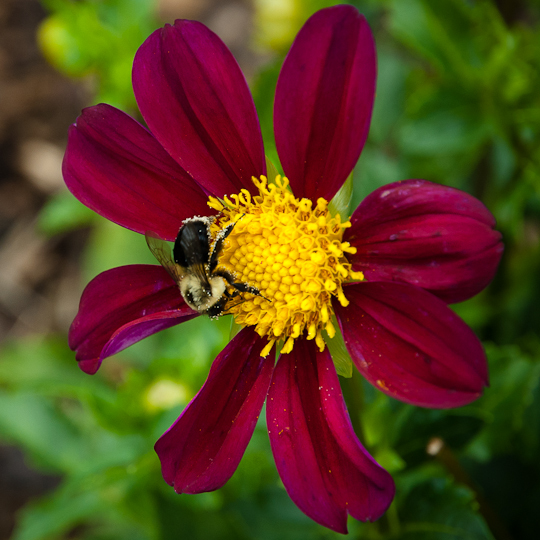 This entry was posted in Journal, Photographs, Photography and tagged Hagerstown, Maryland, North End, old neighborhood, photography, seniors, summer, walking. Bookmark the permalink.